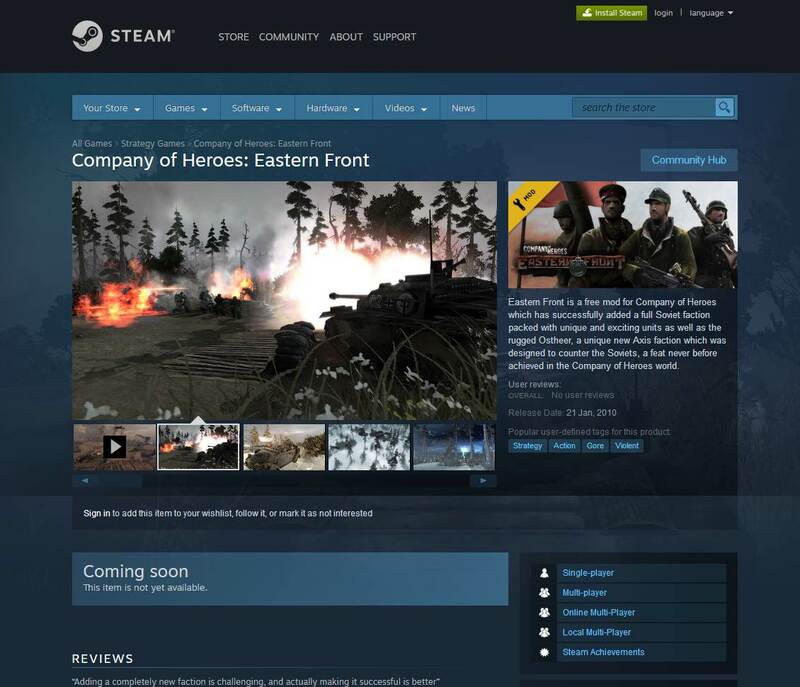 Company of Heroes: Eastern Front is going to be available on Steam very soon! You can check it following this link or by searching the mod in the store. It was really a long process, but by no means this means the mod is finished... we still need to work on some things so expect some minor updates at the future . We will let you know when the build revision is finished, so stay tuned! Re: Eastern Front on Steam! No offense, but considering that the last few news posts talked up the idea of the 'steam version' arriving before the end of last year... "About bloody time!" But seriously, good to hear! I need an excuse to play CoH again (disappointing as 2 was and all - not to mention the 'pause' in my own project due to time commitments with school). I wonder this next version has 2.602 compatibility patch with it? I have changed to 2.602 to compstomp with my bestfriends quite a time already. Much Appreciate that it comes with that patch. I'm drunk now, I'm outranked you in philosophy. any update on the soviet campaign progress yet? Against Jabba and what he has done! this is outstanding !! I cant wait to play it. thank you for making such a great mod, I have had 100's of hours of enjoyment playing this. no more kugelblitz ? even as a reward unit ? stupa never come back ? "S’il n’y avait pas la science, malheureux cloportes suintants d’ingratitude aveugle et d’ignorance crasse, s’il n’y avait pas la Science, combien d’entre nous pourraient profiter de leur cancer pendant plus de cinq ans ?" The New steam version of the mod looks amazing! I found some things unfinished but by general the new models, sounds, and also the bullet graphics are made very well. I have to take a look about the gameplay, build order and balance but looks with fun gameplay. Congratulations about your hard work. I *wish* I could comment on the latest version... But it's STILL not working for me! Get on that will ya!? I stopped playing EF awhile ago because of computer issues and I was too lazy to go through the crazy installation process for EF again. But now that you have it on Steam it is fast and so simple! I'm very impressed with the persistence and dedication from the moderators of this game; and because of your work I will be getting all my friends BACK into playing Eastern Front! ADD me on Steam: Michaelcycle13 (the one with the picture of a dude with brown hair against a blue sky background) And let's play! Also! This community at one time started an online board-game/COH interactive mass game! And me and my friend would be very interested in starting another one of those! Anyways msg me on Steam and let me know if that's something we can restart here! I think it would be fun! Download from the workshop Steam update 2.4.0, but after this it is not possible in the skirmish to choose the side of Britain. Neither can I play for it, nor put a computer to it. That's not the fault of this version, that was disabled from the first released version of EF in Steam at June 6th. We will unlock it when we have finished the changes we need to do to them.